10 YEARS OF MB, 10 YEARS OF SUCCESS - MB S.p.A.
MB celebrated its tenth birthday during the Samoter show in Verona. Ten years have gone by since the company based in the town of Breganze, province of Vicenza, started producing and selling its crusher buckets, a product that has literally revolutionized the concept of construction site jobs throughout the world, creating a new market segment, and has improved and sped up the work of thousands of companies. Today, MB exports in over 100 countries throughout the world and, in addition to having expanded the parent company and having moved to a new and fully equipped production facility, in recent years it also opened branches in Germany, Japan, France and United States. So, upon reaching its tenth year of operations, MB shows quite a respectable resume, thanks to above all the daily work carried out by its qualified team of professionals, its firm belief in research and development and its values, which have made it possible for the company to make a name for itself in just a few years and become the Italian representative of research in design and technology in the construction and earth movement sector. This is precisely why MB decided to celebrate its 10th birthday as only it knows how: by leaving its customers amazed and excited once again. 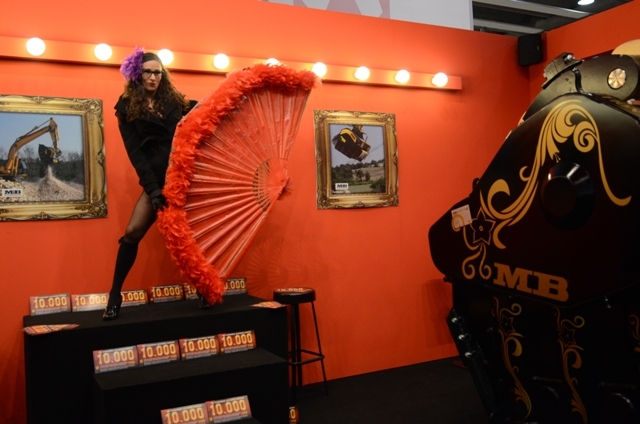 At the Samoter tradeshow, in fact, the company turned its indoor stand into a veritable stage, putting on an incredible Burlesque show that attracted hoards of visitors hour after hour. Among music and sequins, the unquestionable stars of the show were the MB buckets, presented in a new gold and black version for this event. The original and fun-filled initiative aimed at paying homage to customers and visitors as well as at emphasizing, in a playful and ever original manner, the Vicenza-based company's leadership throughout the world and its ability to stand apart from its competitors thanks to its professionalism and cutting-edge research and technological development. Moreover, Samoter offered the opportunity to introduce the new additions to the MB family: the new version of the BF 120.4 crusher bucket and the three screening bucket models. The historical model of the BF 120.4 has changed in order to offer the market an even more revolutionary product, thanks to the in-depth research carried out by MB's team and technicians. The company is constantly committed to satisfying the expectations of its customers, personally attending to their needs and carefully listening to the problems they have to face on the construction site day after day, finding solutions that are suited to the different international settings where MB S.p.A. operates. It is also thanks to this long-lasting relationship founded on trust that MB can provide valid help to its customers. In fact, the new crusher bucket version is now tougher, it has a more compact size and offers a better structural layout that makes it easier for the operator to manoeuvre the excavator. Although its mass is the same, the bucket has become much more versatile and easier to use, also allowing a production increase of up to 10%. And that is not all when it comes to surprises. At the Samoter, MB also introduced the new products developed during the course of last year: the screening buckets (available in 3 models, including the largest screening bucket in the world) and the universal quick couplings. SEE THE LIVE PERFORMANCE OF MB!